Running – just like life itself – has its ups and downs, its ebbs and flows, its highs and lows. So when I think back over a year of running – about 2,000 kilometres worth for me in 2014 – its pretty easy to identify some of the best, and some of the worst moments. 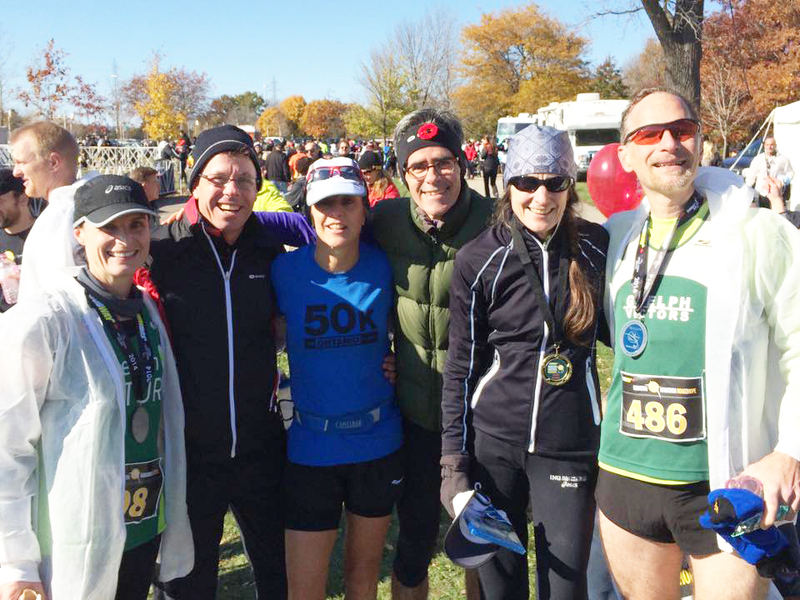 Herewith, a list of my most memorable running experiences of the past year (both the bad and the good), mostly in the company of my Guelph Victors teammates. The day didn’t look very cold at all. The sky was grey and it was late January, but my outdoor thermometer registered 0˚C. That’s hardly cold, once you start burning calories and throwing off internal heat. So I head out for a long run with only a long-sleeved t-shirt, my thinnest nylon jacket, my lightest pair of running tights, plus minimal gloves and hat. Somewhere out on the lonely open roads north of Guelph Lake, over an hour into the run, things change. The wind picks up, the temperature drops, and at the point of a run when I’m normally fully warm and sweating, instead I begin to chill. I’m not the only one suffering. My mates Dean and Eric are also freezing. So we speed up, for warmth and to minimize our time on the exposed roads against the bitter northwest blow. But the last hour of the run is horrible. I arrive home drained, demoralized, dehydrated and pretty mad at myself for not wearing warmer clothes. Normally, our long runs taper by December, as everybody’s big races, the marathons, are complete and our attention is focused on holiday preparations. But somehow this year, there are nearly a dozen of us still running long on Sunday mornings. The group that gathers this week includes all my favourite long run partners, because of their extensive running experience and also their bright social company. As we head out on the “Skinny River” trail towards the upper Eramosa River off Watson Road – a loop we call “Possum Ridge” – we’re making a huge noise, everybody talking excitedly as we dart through the woods. It’s like a party, except instead of alcohol we carry Gatorade and instead of chips or appetizers we’ll be eating thick, syrupy energy gels. We tease each other, recount running foibles and navigational failures, and discuss the upcoming plan for a big club sojourn in spring 2015 – nine of us – to the Mecca of long distance running, the Boston Marathon. The kilometres fly by and the conversations stay spirited well into the second hour of our run. It’s March. I’ve had a solid winter of training, despite the polar vortexes and icy roads of the past three months. Coming up soon is our first big test of the year, Hamilton’s Around the Bay (ATB), 30K road race. I run the race most years, because of the unique distance, because it’s such a great motivator for winter running, and because the race is historic, “older than Boston” as the race t-shirt says, dating from 1894. I’ve raced it about eight times in the past dozen years. It finishes, most pleasantly, inside Copps Coliseum in downtown Hamilton. Except, in the week before this year’s race, I develop a painfully tight right calf. I blame the weekly indoor track workouts I’ve been doing this year, on the small 200-metre oval at the University of Guelph. The tight corners have somehow translated into tight muscles, and I doubt the wisdom of going to Hamilton. Two days before the race, I go for an easy short run with my friends Paul and Lisa. She’s about five months pregnant with their first child and they’re testing a used running stroller (empty!) they’ve just purchased. Barely two kilometres into the run, I have to stop. I limp home, and admit the obvious: it’s a DNS (did not start) for me at ATB. Bummer. Not a great start to the season. 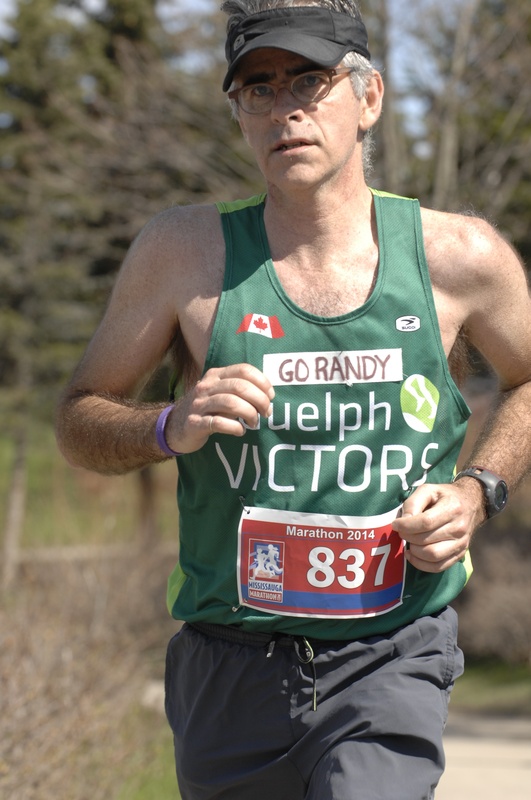 I run regularly with Guelph photographer Dean Palmer. This week, he’s combining business with pleasure: a photo shoot for Canadian Running magazine. They’re doing a story on access to running trails, and Dean wants a shot at the far end of Possum Ridge, where a private landowner is blocking our access to public land (a conservation area) that is adjacent to his property. Paul, Dean and I haul a sled full of Dean’s gear a couple of kilometres into the woods, to where Paul has been clearing a new trail by the river and the landowner is trying to undo his work. Dean spends 20 minutes shooting Paul and I at the trail barrier the owner has erected. 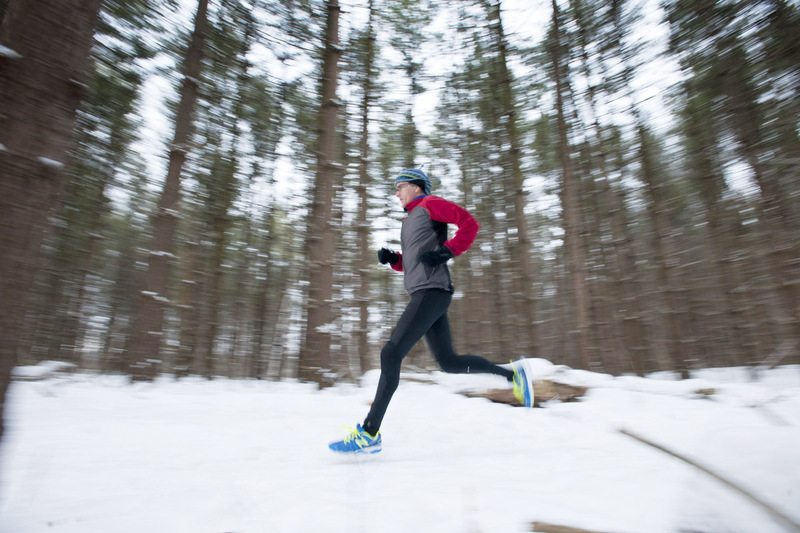 Then we climb the hill on the return trail loop and we take turns running through a replanted pine forest while Dean clicks the shutter on his big camera, looking for a winter shot to complement the collection of running photos he has on display at the local running shoe store. It’s total fun and games, not a run at all. I’m not even sure what Dean is after, but the next day he sends me this shot, which perfectly captures the joy and freedom of winter trail running. I developed a minor health scare early in the year, and it’s playing tricks with my mind. My blood pressure was suddenly quite high, which got picked up on a routine check-up. My doctor recommends low dosages of two medications, an ACE inhibitor and a diuretic, assuring me that they will lower my pressure with little or no side effects. She can’t explain why my pressure should suddenly spike, although it normally rises slowly with age. The medication lowers my blood pressure to normal almost immediately, with no side effects other than slight dizziness if I stand up too fast. But as spring changes to summer, my ability to run hard at our weekly track workouts slips noticeably. I can’t keep pace with my usual cohort. One workout in particular gives me trouble, a “shuttle run” where we scamper 800 metres at 5K race pace and then try to recover over 400 metres running slightly slower, before doing it again. I don’t really know if it’s the medication, or just my head. By August, when I return from holiday and a three-week break from running, I feel fatigued by hard efforts. My 3K time trial (a test run we do every five weeks) is slower by a good 30 seconds than my previous effort in June. And my closest track buddies are dropping me by the end of workouts. I self-diagnose that perhaps the diuretic is robbing me of potassium, so I take supplements. That seems to help a little, but I’m faced with the inevitable: I’m getting older, and without doubt, slower. It’s a hard thing to fully accept or embrace. It’s a spectacular June evening, and we’re about to start a stellar new event: the downtown road mile. It’s linked to a growing elite track meet at the university, the annual Speed River Inferno, which attracts the top middle distance runners in Canada. 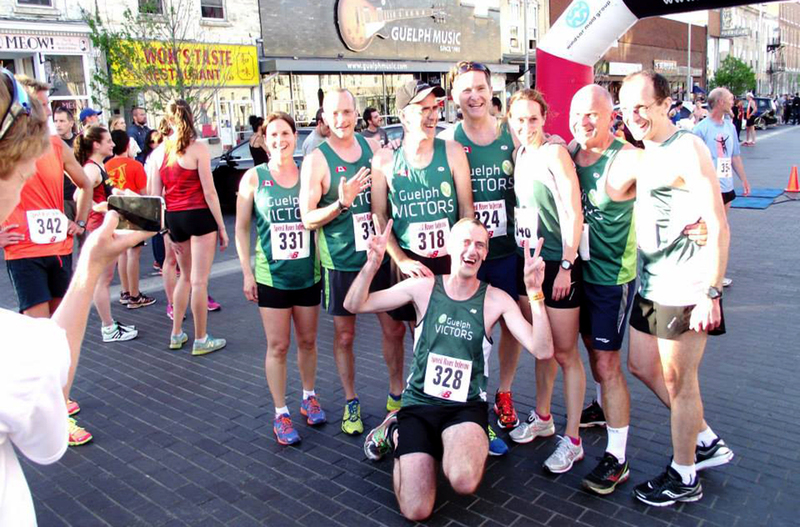 The downtown mile is a warm-up community event, run the night before the track meet. The race starts and finishes on the black cobblestones in front of city hall. It loops twice around a couple of downtown city blocks, climbing the steep rise up Norfolk Street from the market to the Albion Hotel two times. It finishes with a sprint down the length of Carden Street, directly in front of the new splash pad. It’s sure to be a crowd- and runner-friendly event, occurring just as the sun sets on a warm evening that promises summer to come. I’m racing with a perhaps a dozen club members, and I warm up with Dean and Jessica, my best training partners this year. We race nearly in tandem (that’s our photo at the top of this page), the evening sun slanting across the massive, twin-spired hulk of the Church of Our Lady, which overlooks us from the highest point in downtown. I get out-kicked at the finish by club mates Robert and Jessica on Carden Street – they’re 10 and 20 years my juniors – but I don’t care. It’s such a massive celebration of running, speed and racing camaraderie that I’m high on the experience for days afterwards. 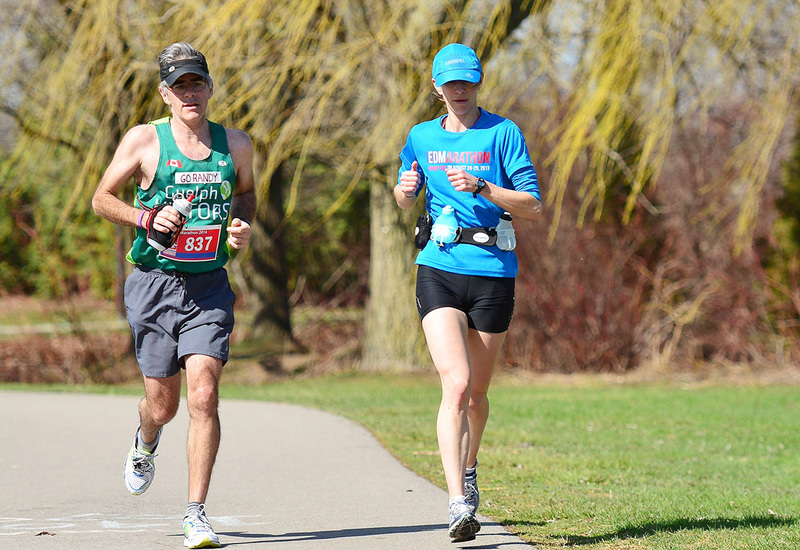 It’s my target spring marathon, the unglamorous Mississauga Marathon. Despite a boring suburban course (run, inexplicably on the very same day as another marathon in downtown Toronto), I have great affection for this event. It’s where I solved the riddle of the sub-three hour marathon in 2010, running my PB of 2:56. This year, my goal is more modest: I aim for a negative split marathon – running the second half faster than the first half – a difficult pacing feat I’ve never accomplished in over a dozen races. As I get ready to leave for Mississauga early that morning, I get an email saying that a longtime Toronto friend’s lymphoma has returned after a year in remission, and he’ll have to face further chemo, and worse, a brutal stem cell transplant procedure later that summer. I pen a label for my racing singlet that says “GO RANDY” and dedicate my race to his coming struggle. Things go well at first. I start conservatively at 4:30 per kilometre pace, which would net me a 3 hours, 10 minutes finish. After the halfway point, I speed up to 4:20 pace. However, the second part of the race features some significant headwinds. By 30K, when club mates Jessica and Cara join me for the last quarter of the race, I’m already feeling almost completely fatigued. In spite of their encouragement, my pace slips to 4:40 and I struggle with every little hill and corner. Either the wind, or thoughts of my friend’s coming cancer treatment, have completely sapped me of the will the fight through the difficulty of the closing 10K. I finish in 3:13, the second half of the race run three minutes slower than the first. But I don’t feel sorry or disappointed – in fact, I couldn’t care less. Instead, I think of my friend Randy and the much bigger challenges he’ll face with his treatment at Princess Margaret Hospital. I slump on a fence at the finish, feeling dejected about my best friend’s sudden misfortune. 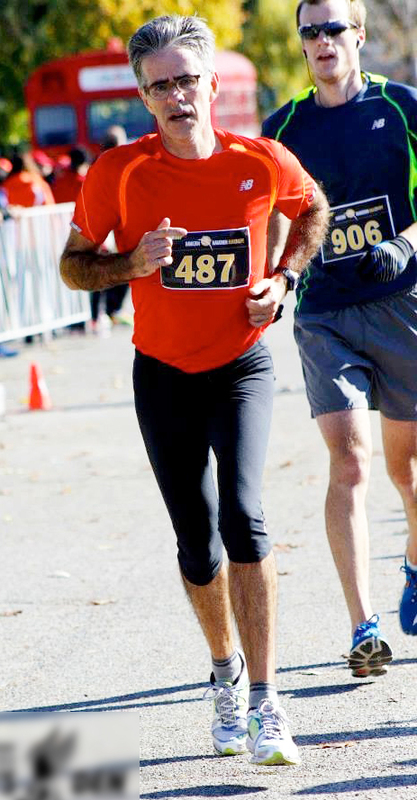 I reprise my goal six months later, at the Hamilton Marathon, very late in the season, early November. This time, I’m on a course that has a long, four-kilometre downhill stretch (straight down the Niagara escarpment!) in the second half of the race, perfect for my race strategy. Again, wind is a factor, especially in the opening 10K when we run northward for a long stretch. However, I work together with club mate Stephen and some other competitors to take turns, running in a tight line and sharing the work. After the halfway point, I run the downhill section as fast as I can, putting over a minute “in the bank”, but then just as quickly lose that advantage over a 3K, winding trail section. At 30K, very close to the fabled marathon wall, I reach the lakeshore, where I’m joined by Dean, who has driven down to help me close the race. We’ll head northwest (and into the wind) for 5K, then turn back downwind for the 7K closing kilometres to the finish. I realize immediately that my race goal will be won or lost between 30 and 35K. As always at that point in a marathon, I’m fatigued, and my resolve is slipping. But I tuck in behind Dean’s large 6’ 2” body and switch off my mind. I focus on one thing only for 22 minutes: the back of Dean’s legs. He runs, and calls out our splits – “4:27, 4:26, 4:28” – and I concentrate on not allowing the gap between us to ever separate by more than a single metre. We’re catching scads of slowing runners, and by the time we reach the 35K mark and turn back downwind, my goal is in the bag, even though I’ve got another half-hour of pretty painful running as my body inevitably tightens up and my legs flirt with cramping. I finish in 3:09, a one-minute negative split, my first ever in 15 marathons and 15 years. Rejoice! Postscript: After enduring chemo, a gruelling stem cell transplant, three weeks in hospital isolation, partly with a hospital-acquired viral infection, then radiation, and even a brief case of shingles, my buddy Randy emerges from treatment with his lymphoma in retreat once again. Hallelujah! My two 42-kilometre races neatly bookend his six-month struggle with the disease. Now that’s a real marathon.